ROBLOX Direct Visit Stats – 16th April | Roblox Direct!! Wow! Look at this chart! I recently looked at the Site Counter, and then discovered that ROBLOX Direct got 6,230 views in only March! 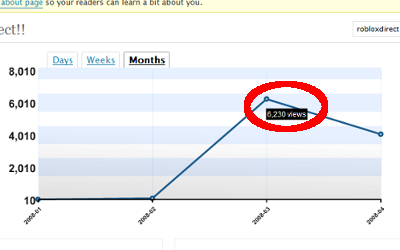 And guess what: we were announced on the ROBLOG on March 24th, and in just 7 days, it got 6230 visits! I’m planning to post a chart every 15th of the month, so stay tune!